When a system is taken from state i to state f along the path iaf in below figure, it is found that Q = 50 J and W = -20 J. Along the path ibf, Q = 36 J. (a) What is W along the path ibf? (b) If W = +13 J for the curved return path fi, what is Q for this path? (c) Take Eint,i = 10 J. What is Eint.f? (d) If Eint,b = 22 J, find Q for process ib and process bf. Here Q is the energy transferred (as heat) between the system and environment, W is the work done on (or by) the system and ΔEint is the change in the internal energy of the system. By convention we have chosen Q to be positive when heat is transferred into the system and W to be positive when work is done on the system. A system is taken from i to state f along the path iaf, which as shown in below figure. Thus, the work done W along the path ibf would be -6 J. Thus the Q for curved return path fi will be -43 J. Therefore, the value of Eint,f would be 40 J. And there is no work done on the path bf, since volume is constant. Thus the value of Qbf will be 18 J. Therefore the value of Qib would be 18 J. One mole of an ideal monoatomic gas is caused to go through the cycle shown in below figure. 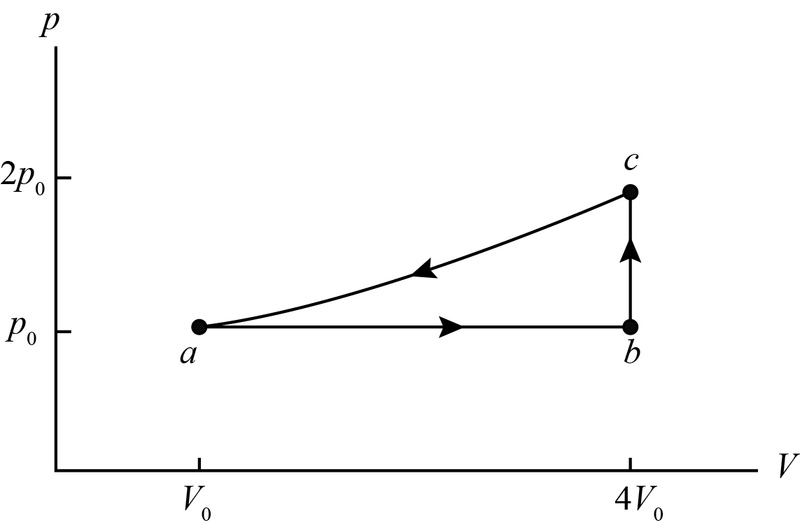 (a) How much work is done on the gas in expanding the gas from a to c along the path abc? (b) What is the change in internal energy and entropy in going through one complete cycle? Express all answers in terms of the pressure p0 and volume V0 at point a in the diagram. Here p is the pressure and ΔV is the change in volume. Here n is the number of moles, R is the gas constant and ΔT is the change in temperature. Here, Tf is the final temperature and Ti is the initial temperature. One mole of an ideal monoatomic gas is caused to go through the cycle as shown in the above figure. To obtain the work done Wabc along the path abc, first we have to find out the work done Wab along the path ab. From the above observation we conclude that, the work done on the gas along the path abc would be -3 p0V0. From the above observation we conclude that, the change in internal energy ΔEbc in the path b to c would be 6 p0V0 and the change in entropy ΔSbc in the path b to c would be 3/2 nR ln2. The change in entropy and internal energy in a cyclic process is zero. Since the process is a complete cycle, therefore the change in entropy and internal energy in going through one complete cycle would be zero. 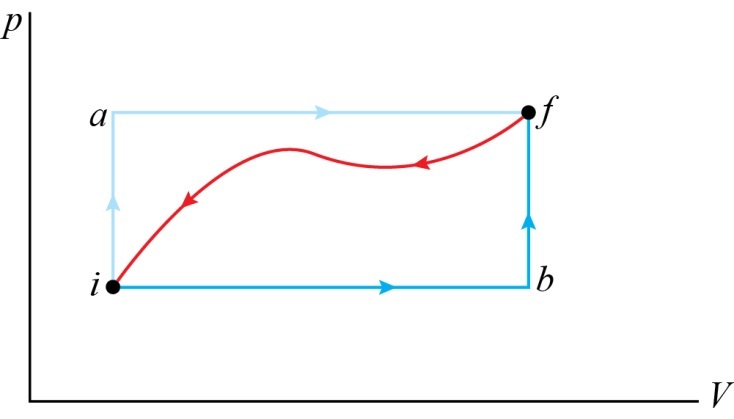 For the Carnot cycle shown in below figure, calculate (a) the heat that enters and (b) the work done on the system. Here Q is the positive heat flow into the system. So the entropy ΔS of the system will increase. Here Sf is the final entropy of the system and Si is the initial entropy of he system. Here Q is the heat added to the system and W is the work done. (a) We have to calculate the heat Qin that enters into the system. In the above cycle, the heat only enters along the top path AB. Therefore the heat Qin that enters into the system would be 200 J. (b) To find the work done, first we have to find out the heat that leaves Qout from the bottom path of the cycle. In the above cycle, the heat only leaves along the bottom path CD. Thus the heat that leaves Qout from the bottom path of the cycle would be -125 J. From the above observation we conclude that, the work done W on the system would be -75 J.